Here's another game for fans of Crush the Castle. 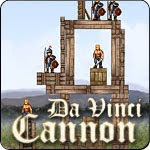 Aim your cannon and launch projectiles at the opposing structures as you try to kill the occupants. Use your mighty cannon to crush the opponents! Select your choice of cannonball, calculate the power and angle and then fire away. Kill all the baddies in as few shots as possible.